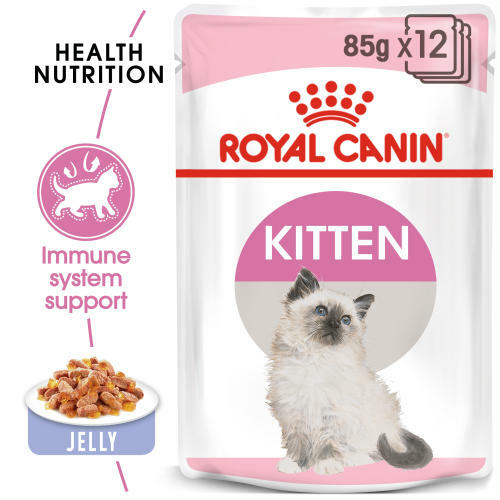 ROYAL CANIN Kitten In Jelly Wet Cat Food is both delicious and nutritious! Immune system support - Helps support the 2nd age kitten’s natural defences by maintaining health. Easy chewing - Small chunks in gravy texture. Additives: Vitamin D3: 175 IU, E1 (Iron): 3mg, E2 (Iodine): 0.38mg, E4 (Copper): 3mg, E5 (Manganese): 1mg, E6 (Zinc): 10mg. Composition: Meat and animal derivatives, vegetable protein extracts, derivatives of vegetable origin, cereals, minerals, oils and fats, yeasts, various sugars. Crude ash: 1.7%. Crude fibre: 0.6%. Crude oil fats: 4%. Moisture: 79.5%. Protein: 12%.